In the spring of 1979, screenwriter Victor Miller was working on a movie script for his best friend, Sean S. Cunningham, an already accomplished director whose credits ranged from G-rated family romps to an R-rated sexploitation comedy-mystery. This new work was tentatively called Long Night at Camp Blood by Miller, but its official title was declared in a publicity ad in the July 4th, 1979 issue of Variety, the film’s now-iconic logo bursting through glass, announcing its name to be Friday the 13th. And while this date has a long history of being considered unlucky in Western superstition, its hard to hear the term without thinking of this film and the massive franchise that followed it, especially the memorable original theatrical poster, a portrait of the doomed Camp Crystal Lake counselors revealed inside an outline of the mysterious killer, a bloody knife grasped in the culprit’s hand. 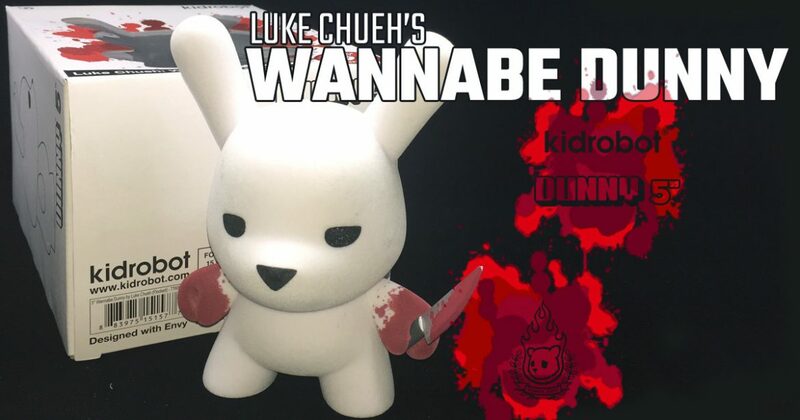 And to coincide with today being Friday the 13th, Kidrobot are celebrating by issuing their own blood-stained blade-wielding creature, Luke Chueh‘s Wannabe Dunny, which seemingly stems from two previous creations by the artist. Early in his career, Chueh painted a piece titled Black in White (2004), illustrating the effect of one’s perceived façade by placing a sad-eyed black rabbit inside the costume of a white one. The following year, in 2005, the artist revisited this concept with Black in White and Red all over, turning the palpable grief of the original into a sinister appearance, demonically yellow slanted eyes staring at the viewer as the beast unburdens itself of its bloody attire. Interpreted sculpturally by Dave Pressler and produced by Munky King as a limited edition designer toy in 2010, the contrast between Black in White‘s two main colors were further distinguished by the smoothness of the dark vinyl being wrapped in a light-colored fursuit, each piece accompanied by an interchangeable cloth-covered head to match its dress as well as a plastic knife for it to brandish forth. Around the time this was being issued, as well as its successive Black in White and Red all over (2010) and White in Black (2011) editions, Chueh was working with Kidrobot to create his Blood & Fuzz (2009 & 2010) concept on the company’s anthropomorphic rabbit character, the Dunny. With a face-encompassing splatter of red decoration representing the title’s “blood” aspect, the “fuzz” element was achieved on these designs through a flocked exterior, a series of small fiber particles adhered to the vinyl surface to provide a soft texture. Reminiscent of both Black in White and Blood & Fuzz, Chueh’s Wannabe Dunny seemingly borrows facets from each to create an new sculptural work. Once again playing with façades, the original concept of Chueh’s Wannabe Dunny entailed it having the artist’s bear-style ears permanently attached to it as well as a removable headband sporting the Dunny’s standard rabbit-like ears. Colored to appear as a traditional bunny in this initial iteration, Chueh’s concept was ultimately simplified so that the Kidrobot-produced form’s head was subtly shaped more like that of Chueh’s bear character and the artist’s proposed alternate bloody decoration became the primary one. Easily interpretable as a different beast trying to look like a Dunny, this roughly 5-inch tall flocked design comes with a blood-red-covered knife and splattered crimson detailing on its hands. Simultaneously macabre and cute, Chueh’s Wannabe Dunny is limited to an edition of 1500 sculptural pieces. And even though nothing implicitly implies it, one can easily imagine that under this soft bunny’s shell lurks an ominous black rabbit. Important Note: How to Insert the Knife Accessory into Luke Chueh’s Wannabe Dunny‘s Hand without Ruining the Flocking. Click Here to Acquire Luke Chueh’s 5″ Wannabe Dunny from Kidrobot, or Click Here to Find a Kidrobot Retailer to Order it from.